Oklahoma coach Lincoln Riley could not help but admire Jalen Hurts from a distance. He respected how the Alabama quarterback who lost his starting job to Tua Tagovailoa put the team above his pride. Hurts could have transferred right after Alabama went another direction, as so many quarterbacks do these days. Instead, he stuck it out and delivered a moment for the ages. After Tagovailoa went down with an injured ankle during the SEC title game against Georgia, Hurts rallied the Crimson Tide to victory. Riley will get to know Hurts a lot better soon: The quarterback announced Wednesday in a story in the Players’ Tribune that he will transfer to Oklahoma. He will be available immediately as a graduate transfer. “So to my about-to-be family in Norman, I truly appreciate you for bringing me on board. Y’all don’t know me yet… but just for now, to introduce myself: I’m a motivated coach’s son from the Eastside of Houston, and I love to play ball,” Hurts wrote. Hurts leaves Alabama with 5,626 yards and 48 touchdowns passing and 1,976 yards and 23 touchdowns rushing. If he starts for the Sooners in their wide-open offense, more huge numbers are possible. If so, he will follow in the footsteps of Kyler Murray, another dual threat maestro who is currently deciding whether to play in the NFL or Major League Baseball. Murray waited his turn behind future No. 1 NFL draft pick Baker Mayfield, then delivered the second-most efficient passing season in FBS history while rushing for 1,001 yards and 12 touchdowns last season. Riley’s short history with transfers is spectacular. Murray transferred from Texas A&M before winning the Heisman Trophy at Oklahoma this past season. Mayfield transferred from Texas Tech before winning the Heisman at Oklahoma in 2017. Neither was very efficient in their stops before playing for Riley. Hurts could be next in line to make a dramatic leap. “I’m very fortunate to have this opportunity, and I’m excited for the journey ahead,” he said. Thirteen months ago, Hurts was a two-year starter who led Alabama to a pair of national championship games and was Southeastern Conference offensive player of the year as a freshman. 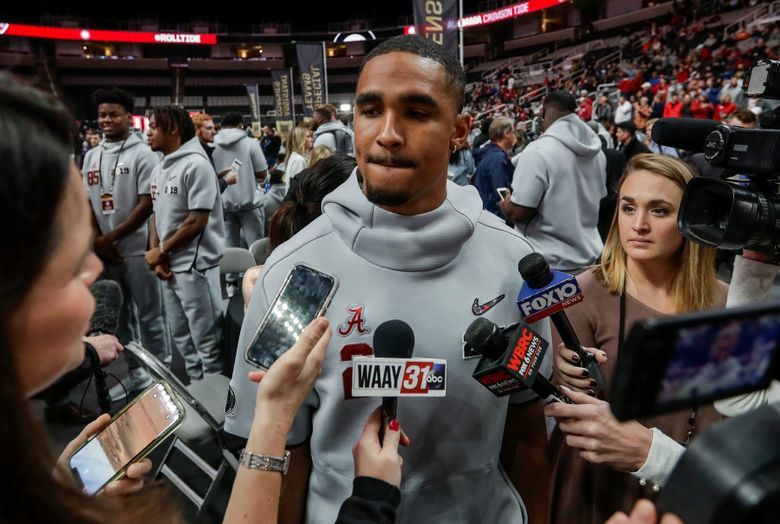 In the 2018 national title game, with Alabama down big at halftime against Georgia, Tagovailoa replaced him and led the Crimson Tide to victory. Tagovailoa then beat out Hurts for the starting job heading into this past season and finished second in the Heisman voting. Hurts finished the season with 765 yards passing and 167 yards rushing. Hurts should help Oklahoma smooth its transition from Murray at quarterback. Last year’s backup, Austin Kendall, is expected to transfer. Tanner Mordecai, a freshman last season, is the only quarterback currently on scholarship for the Sooners. Five-star recruit Spencer Rattler, the consensus No. 1 quarterback in the Class of 2019, is committed to the Sooners. Hurts has a special place in Alabama history. When he graduated with a degree in public relations, he got a standing ovation as he walked across the stage. “And to my Bama family, once again, THANK YOU — for everything. It’s been a great three years. I’ll love you until the end of time!” he said.